(!) If you are using Acronis Backup & Recovery 10, see Acronis Backup & Recovery 10: Using Microsoft VSS instead of Acronis VSS. By default, Acronis Backup & Recovery 11 uses Acronis VSS Provider which interacts with Microsoft VSS to create volume shadow copies of the data. However the actual VSS snapshot created by Microsoft VSS is not used: Acronis Backup & Recovery 11 uses its own snapshot. Acronis Backup 11.5 has Microsoft VSS provided selected by default. Troubleshoot VSS-related issues with the free Acronis VSS Doctor tool. If it didn't help and you still need to switch the VSS provider to Microsoft VSS, follow instructions below. 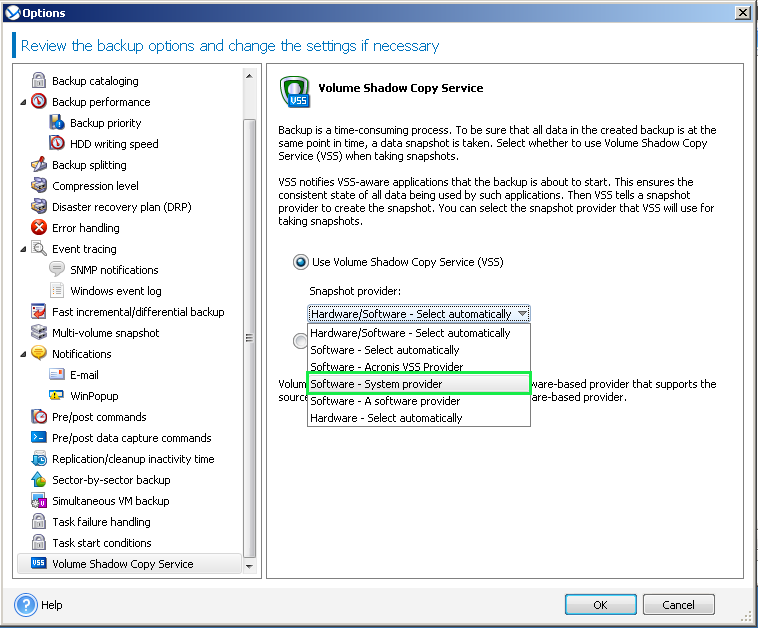 To set Microsoft VSS usage for all backup jobs, go to Options -> Default backup and recovery options -> Default backup options. To set Microsoft VSS usage for a backup plan, create a new backup plan or open an existing backup plan for editing, then go to Plan parameters -> Backup options. On the machine with the Acronis Agent for Windows, go to Start-Run -> services.msc -> and locate Acronis Managed Machine Service. Restart MMS: right-click on Acronis Managed Machine Service and select Restart. Make sure the task is launched with Administrator credentials: in Create/edit backup plan window go to Plan parameters and press Show plan's credentials, comments, label. Look under Plan's credentials: the specified account needs to belong to Administrators group. See also Using Microsoft VSS instead of Acronis VSS. (!) Backup with Microsoft VSS provider on Windows Small Business Server 2011 may not work correctly after Microsoft SharePoint Foundation 2010 Service Pack 1 (SP1) installation.